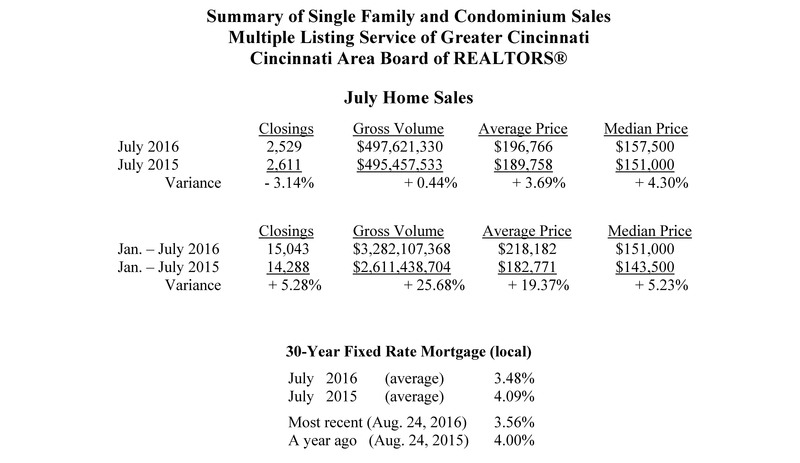 Greater Cincinnati home sales this month were strong, yet down – 3.1 % compared to a record setting July a year ago. July home sales were 2,529 compared to 2,611 in July 2015. For the first seven months of 2016, home sales are up almost 5.3% over the first seven months of 2015. “July home sales continued their upward momentum compared to a record setting month a year ago,” said Patti Stehlin, President of the Cincinnati Area Board of REALTORS®. “Housing in Greater Cincinnati is very affordable and the sales this month were the second highest in over 10 years,” said Stehlin. The average home price jumped to $196,766 compared to $189,758 a year earlier, a + 3.69 % increase. At the same time, the inventory of homes for sale, as of July 31, continued its year-over-year declining trend to 6,965 from 8,800 a year ago, down – 20.9%. “Our current inventory of homes for sale has been low for some time, but as new construction increases and consumers wishing to sell put their homes on the market, we will see an increase in sales and slow growth in inventory. Remember, if a home is priced right and is in move-in ready condition, properties are selling quickly,” said Stehlin. Local home mortgage rates in July averaged 3.48% for a 30-year fixed rate loan. The rates were higher at 4.00% a year ago. At these fixed rates, the monthly principal and interest payment on a $100,000 home loan with no money down would be approximately $448. Nationwide, July home sales were down – 3.2% from June on a seasonally adjusted basis, and were down – 1.6 % from July 2015.